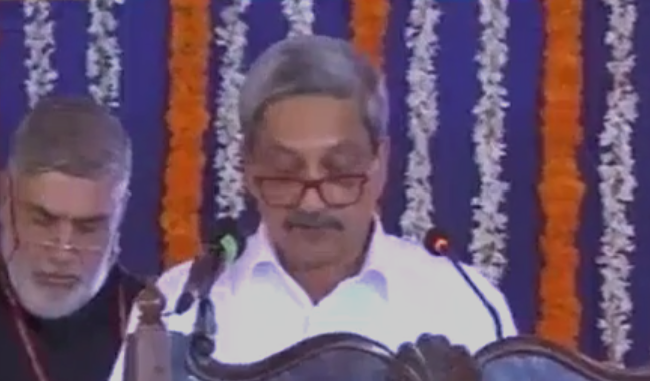 :Panaji: Manohar Parrikar, who resigned as Defence Minister, today took the oath of office and secrecy as the chief minister of Goa. Parrikar heads a BJP-led coalition government. The BJP, after trailing behind the Congress in the just concluded Assembly election, managed to muster support of local allies and a few independent MLAs to stich a majority and stake claim to form a government. Earlier today, the Supreme Court rejected a Congress plea to block the swearing in and ordered a floor test for Parrikar to prove his majority on March 16.